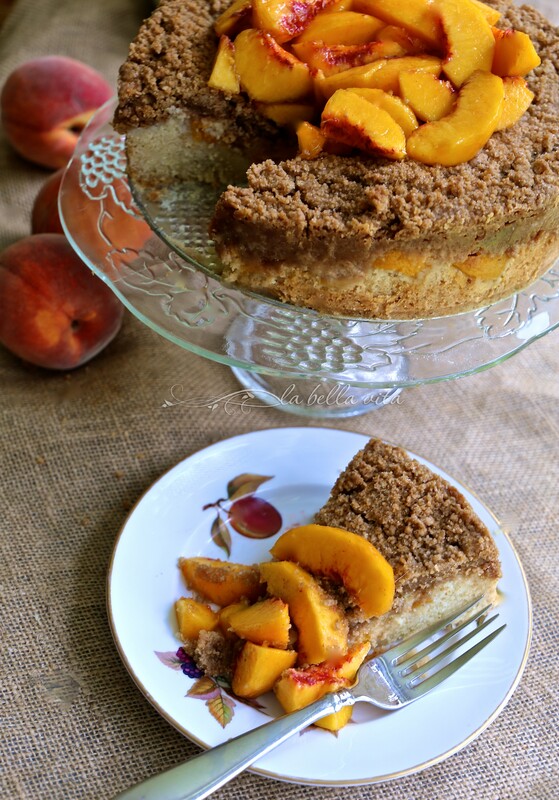 Summer just wouldn’t be summer without baking up something sweet with fresh, ripe peaches. Luckily for us, we live in a huge peach-producing state (South Carolina) with a harvest season that lasts well into September. Juicy, sweet, and perfectly ripe peaches add so much to baked treats! Peaches are very prized in Italy, especially in the northern part of Italy that experiences that necessary shock of cold winters. In fact, my family in Modena, Italy say that peaches are their favorite fruit. Whether eaten alone or in a pie, cake or crostata, I totally agree with them. Another thing that many people don’t know is that in northern Italy in the regions that are very close to Austria and Switzerland, streusel toppings are quite common. And oh does streusel add to the deliciousness of a cake! 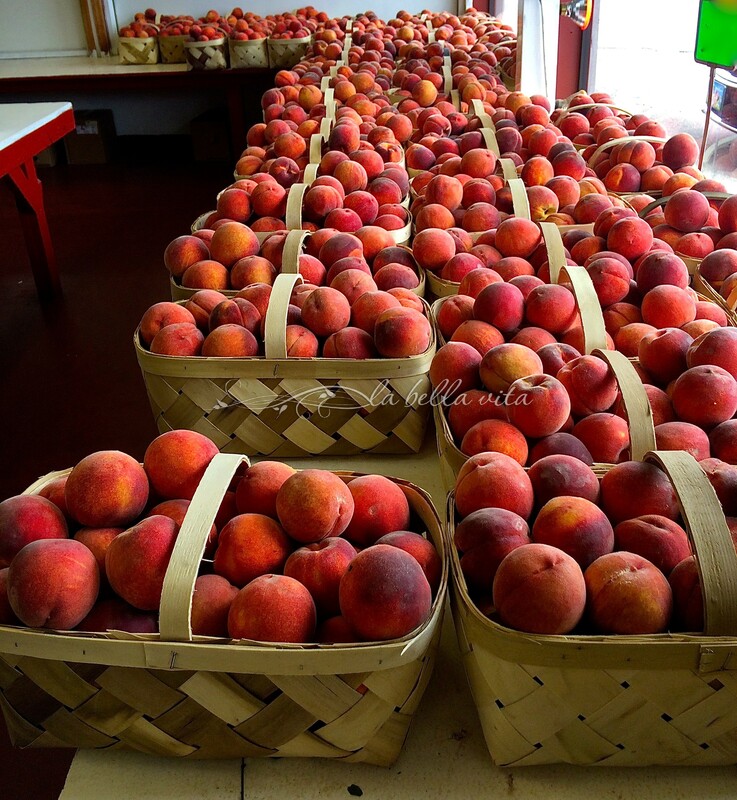 As you can see, we’ve enjoyed another bumper crop of peaches in South Carolina this year! More to enjoy either straight of our hands or used in a pie, salad, or jam! So pretty, they could be painted in a still-life piece of art! I took one of the bushels home with me! I baked this in a 9″ springform cake pan, because we prefer taller cakes. They just make such a huge impression! It does require a longer baking time though, so after 60 minutes, check on the cake’s doneness with a toothpick and bake for 10 to 15 minutes more if necessary. 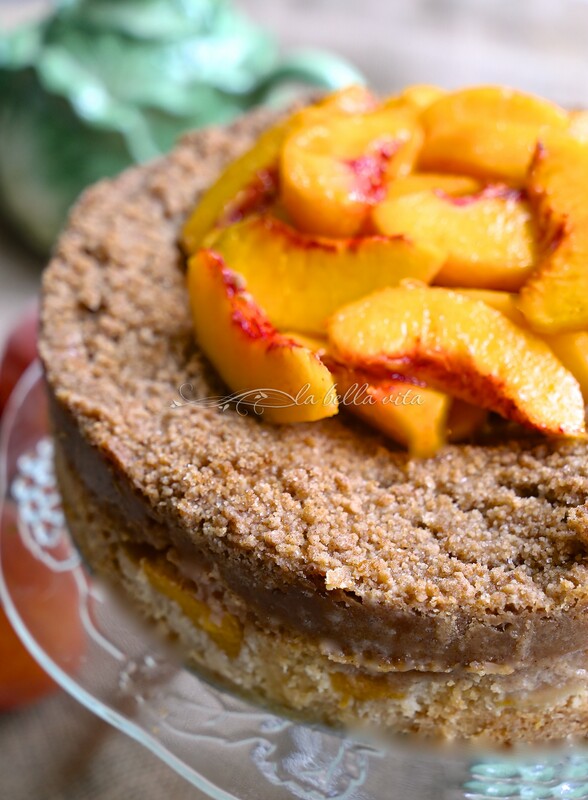 Even if your cake drops a bit in the middle, topping it with fresh peaches prevents the indentation from showing! Just look at all this streusel . . . caramelized with sweet butter! Irresistible! Some of you recall that my mother has recently passed away. I am blessed to have received her cherished English “Evesham” dishes. To serve each slice of the cake, I specifically chose the dessert plate in her collection that has beautiful peaches painted on them. I think that my mother would be very happy for me to use her dishes with love. Peaches were also my father’s favorite fruit. Please share the love and pin this vertical image . . . thank you so much! Pre-heat oven to 350°. Grease and flour an 8″ springform cake pan. In a medium bowl mix together peaches and sugar, set aside. In a large bowl whisk together flour, sugar, baking soda and salt, add butter using a pastry blender or fork combine to form a crumbly mixture. Add eggs, the Fiori di Sicilia or Vanilla Extract, and yogurt and continue to mix until just crumbly. 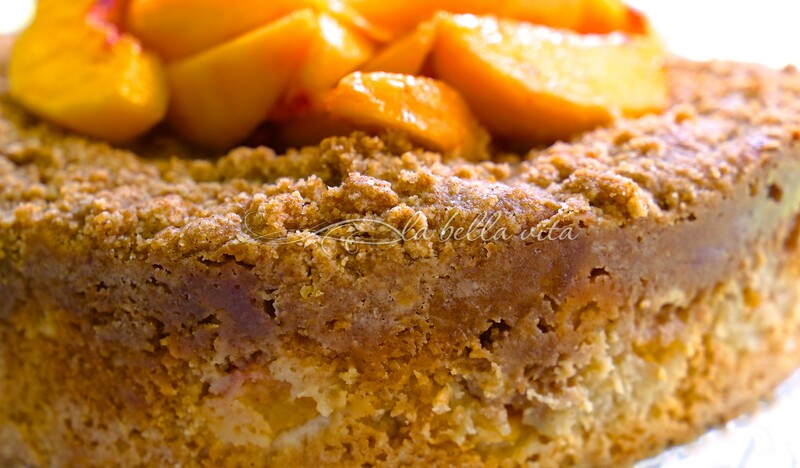 Add crumbly cake batter to the springform pan, spoon peach mixture on top and sprinkle with streusel mixture. Bake for approximately 30-40 minutes or until lightly golden on top. Let cool. Wow! This looks absolutely wonderful! 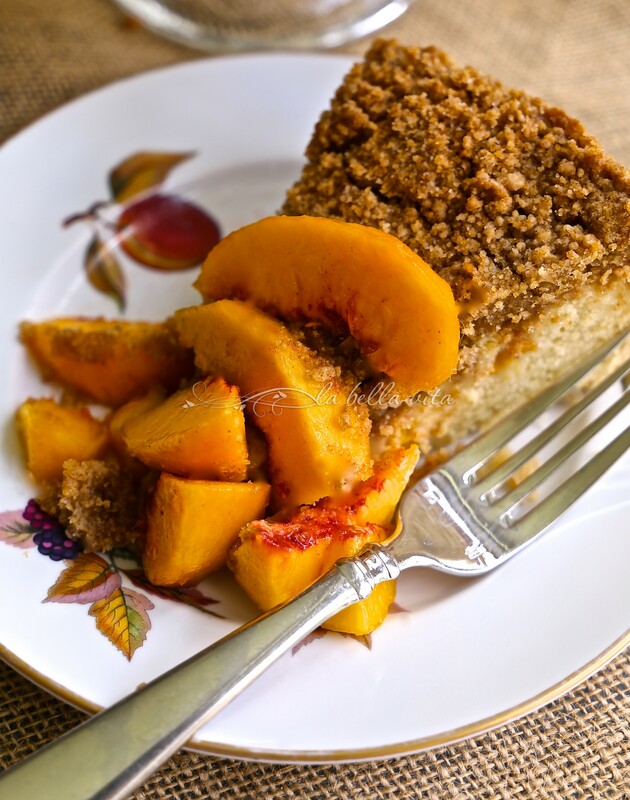 Peaches are my favorite fruit, too, and I adore streusal topping. You are so fortunate to be able to get good peaches there. I have had a harder time getting good peaches here lately. Oh well, it makes you appreciate it even more when you can get them. Thanks so much for this recipe, Roz! The streusel topping really made this cake Shari! I’m like you, I adore streusel! I could put it on any cake or pie! 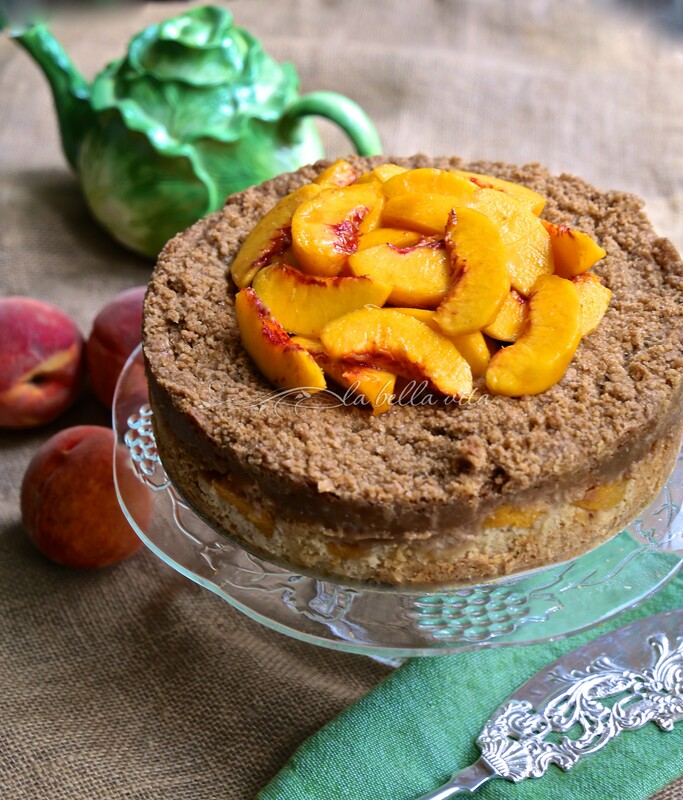 What fabulous photos of those peaches and the peach cake. Streusel is my all time favorite and your cake looks divine. thank you so much Judee! I love streusel on just about any sweet treat! This looks absolutely DIVINE, Roz. Those sliced peaches are so juicy and sweet. Thank you Angie, my husband ate the entire thing! HA! I love peaches as well… so sweet during the summer period that it is impossible to not eat them! Your cake is fantastic and with these peaches is much more tasteful. Ciao Ilaria, Thank you for your lovely visit! I hope to be able to enjoy delicious peaches from Italy someday! Hope you’re doing well! This looks absolutely amazing! I’ll definitely be trying it soon. Let me know what you think Susan! Let me know when you’re back from your blog break too, please! The peaches look amazing. Thanks for much for sharing this recipe and I plan to make it real soon. I hope that you do Carolyn, and if you do, please let me know what you think! Thanks for stopping by! Roz- When peaches are truly ripe and in season, they’re my favorite fruit. I would love a slice of that streusel cake with a cup of tea. Your mom would love knowing you are using her beautiful china. I agree, Linda, when peaches are perfectly fresh, they’re just the best! Absolutely gorgeous, Roz! This is a show-stopper of a cake! This cake seems so delicious and crunchy, have a good week my dear, un abbraccio ! Grazie cara Chiara! Have a glorious day! You got that right Susan! Grazie della tua visita, è un piacere arrivare da te e trovare questa bella e golosissima torta, complimenti!!!!! Prego! Grazie for your kind comment! Oh thank you Liz! I’m catching up with a lot of earlier (way earlier) blog comments from everyone! I’m crossing my fingers for another wonderful summer of peaches this year! As always, this sounds delicious. And how special to serve it on your mom’s plates. Yes, it was special to serve this on my mother’s plates and I thank you for mentioning that Mindy! That really means a lot to me! I’m so glad that you like this recipe with peaches Betsy. They are also one of our family favorites too! You’re welcome clojo! The streusel topping sends this over the top! I could eat that alone! Oh thank you so much for your kind compliments Sarah! I certainly will keep the recipes coming for you, and since my husband is a sweets addict, I can guarantee that there will always be more recipes for sweets! 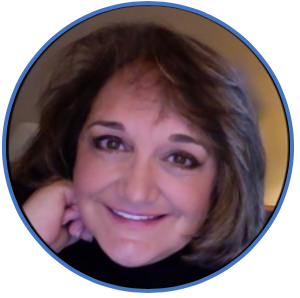 I’m so glad to have you visit my blog and leave a comment so that I can chat back with you! awesome food blog you have placed here. I have read it and it was really nice and informative. Thanks for placing it here. I have bookmark this site for future visit. Your content was really resourceful reached. Thanks for such a nice creation.